When looking at a palm print for financial potentials there are a few factors to consider. Typically the fate line is the most important one to examine. Where the fate line travels through the palm describes the type of energies expected to encounter. At the same time, markings such as crosses, stars, islands, etc. determine energies associated with financial outlooks as well as timing. If the fate line is stretched to Jupiter (index finger), the native is thought to have good luck. Yet, if it reaches over to Saturn, the individual will have to work very hard, probably harder than most to achieve recognition. 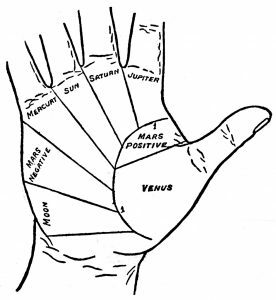 Outside of Palmistry, Saturn interpretations also translate to having long lasting results. So to put a positive spin on this meaning, Saturn rules more than just restriction. If the fate line stretches over to Apollo (the Sun,) like Jupiter it is said to be fortunate. The individual will be very creative and find innovation. The best entrepenuers have this. Finally, if the fate line spread to Mercury, there is learning, communication, writing, teaching associated with finances. a) Strong lines will reveal energy and drive. b) Small hands can see a larger picture and move quickly. c) Star marks under Jupiter and Apollo finger. Fire shaped hands can make money very quickly and burn through it just as fast. Earth hands earn money through hard work application; they will cautiously invest and be the most frugal. Water hands are the best when it comes to intuition in money matters. This is an ideal hand for a stock broker. Air hands will have ideas about money, but lack the will force to take action. In the previous articles, I mentioned that the markings on the palm change with time. I have seen this for my own print from over a decade ago to the most current. Venus Mount – Thumb area: Like in Astrology, Venus also rules possessions and earning capacity. Marks and symbols have dual meanings for both finances and love. In fact, for abundance in finances that comes from family, this mount is very active. The art of timing in palmistry can clues in terms of time periods and type of change that can be expect in the finances. For example, an island marking can indicate being placed in a situation that may feel confining. When other lines intersect, it will indicate a change of circumstances. The art of Palmistry is informative and fun. When used with addition to other tools, the confirmation it brings is insightful and certain.